Great music inspires great dance, as the Royal New Zealand Ballet brings works by Kylián and Balanchine - two of the greatest choreographers of all time - to New Zealand stages, together with an exciting new commission from New Zealander Corey Baker. Petite Mort, inspired by Mozart’s late piano concertos, is one of legendary Czech choreographer Jiří Kylián’s most celebrated works, it is here paired with his witty and energetic Sechs Tänze. Divertimento No. 15 by the great and influential Russian-American choreographer George Balanchine, was created for 16 dancers of New York City Ballet in 1956, t0 what he considered to be the finest divertimento ever written. Birmingham-based, Christchurch-born choreographer Corey Baker’s new work, tailor-made for the RNZB, completes this programme of New Zealand – and world - premieres. 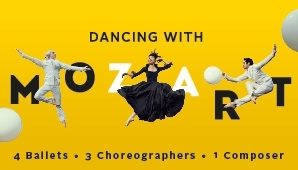 Accompanied live by The Christchurch Symphony Orchestra, this mixed bill of four outstanding dance works, set to the music of the master Wolfgang Amadeus Mozart, will delight lovers of classical music, tutu ballets and contemporary dance alike.